They aren't exactly yard art, but they are a fun, artistic way to differentiate yourself from your neighbors. And, it had me wondering...when did we start using mailboxes? According to Infoplease, in the early 1800s, most letters in the U.S. were taken to the post office to be mailed, and recipients had to retrieve their mail from the post office. It wasn't until 1863 that mail was delivered without additional charge to homes of people who lived in cities. 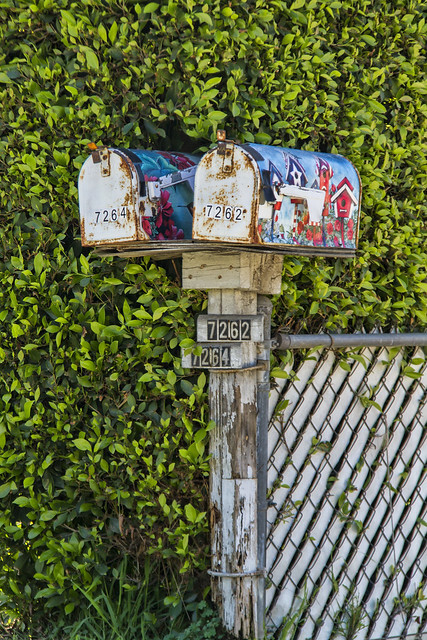 By 1890, hundreds of cities delivered mail to residents' homes, thus leading to a need for mailboxes. Of course, mail has changed over the past ten years. When was the last time you wrote a letter to someone? Mailed a bill? Pretty soon, these boxes, though appealing, may be obsolete. I love seeing unique mailboxes. Thanks for sharing this bit of history with me.